Companies must either properly manage the complex world of legal and corporate risk or suffer the consequences. 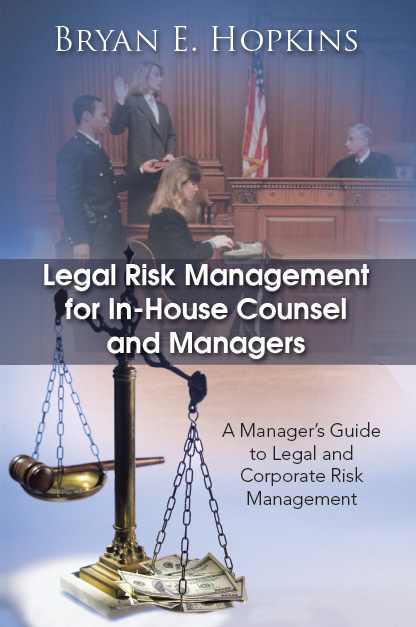 Author Bryan E. Hopkins, the former general counsel of Samsung Electronics America, identifies the numerous areas of legal and corporate risk that managers and their company counsel face daily. More importantly, he provides concrete examples that demonstrate how to minimize or mitigate legal and corporate risk. • navigate the discovery process. Legal counsel must take an active effort in developing strategies, systems, and processes that minimize the legal risks faced by the company on a daily basis. Managers must also be involved to ensure the company develops a successful legal risk management program.